The WP eStore shopping cart plugin can be easily integrated with AWeber (Email marketing and Autoresponder service) so that your customers can get signed up to your AWeber list when they make a purchase. A customer purchases a product. A visitor submits a squeeze form for a product. Now all you need to do is specify the AWeber list ID of the list where you want your customers to be signed up to. You can signup all of your customers to one global list by checking the “Global AWeber Signup” option and then specifying the list ID in the “Global AWeber List Name” field. Make sure to hit the “Update” button at the bottom of the Autoresponder settings page after you make the changes. You can also signup your customers to a specific list on a per product basis by specifying the list ID value in the “List Name” field under the “Autoresponder settings” section of the product in question. Hello, Admin. How about integratioin with Lyris? There is an API, and also email commands. Perhaps I can work with you in getting this done, as I work with the software daily. You can email me at the address provided in this posting. Thank you! Ah I see, yes you will need multiple parser for different websites and yes the from email address will come into play in that situation. At first, I thought you meant subscribing users to different lists for different products from the same website (in this case you don’t need multiple parsers). So what exactly is this parser doing? I’m still a little hazy on this concept. There’s no info entered that’s eStore-specific (in Aweber). The only thing that was really modified (as shown in your tutorial) was the from address. If I used [email protected] for my one eStore installation and [email protected] for the second one, and wanted to have two separate customer email lists, surely I’d need a parser for each of these addresses, wouldn’t I? @Bentley, Nope, the from email address doesn’t matter when it comes to which list they are going to be subscribed to. The customer will be subscribed to the list you specify in eStore’s settings menu of the individual product setting. So no need to configure multiple parsers. 1) Will there be an issue if a couple of my Aweber lists come from the same email address. i.e. is there a chance that a customer would end up on another list in my Aweber account that uses the same “from” address, or is the fact that I’ve entered the specific “[email protected]” info in the eStore Aweber settings section enough to ensure that doesn’t happen. 2) Should I be setting up multiple eStore parsers – one for each list I want to add customers too – OR is it based solely on the from address? ie if I have a bunch of different eStore customer lists but they all use the same email address, will that one parser connect people with the correct list (again based on the list name info entered in each Aweber settings section)? We made sure that the AWeber’s terms and conditions are followed correctly when doing the integration to make sure a user’s account do not get blocked suddenly. I created an aweber list for my buyers where I receive emails from Wp estore plugin and from DLGuard. I disbled the doble optin feature so that all my buyers receive the updates and bonuses without having to confirm. The process works well with DLGuard (people don’t have to click on a confirm link) but with WP estore every time someone buys a product, this person doesn’t receive the email until she/he clicks on a confirm link. Can you tell me if there’s a solution for this please? Did I miss something? Hi Jenna, This usually happens when the email parser is not setup correctly. Please make sure to follow the steps in the above video (Step 1: Create an Email Parser) to ensure that the email parser is setup correctly. If this does not fix the issue you are having please let me know. Hi. When I set this up it subscribes my email address to my aweber account instead of the email address of the buyer. What am I doing wrong? How do I collect the buyer info?? Thanks so much for creating such a fabulous product! Nope, you can have both on at the same time. If I set up the the global setting do I need to turn off the individual product settings for the email list? In the Trigger Rule field is: [email protected]. Thanks for that… now, can you please tell me the value you have in the “Trigger Rule” field of your AWeber Parser? The issue you are having is usually related to the values not matching (it’s case sensitive). I don’t know why the previous comment cut out the email address. I’ll try this again. In the eStore’s “From” field is Camille Smith [email protected], with the brackets around the email addy. Nope, it’s suppose to add the customers name. What do you have in the “From Email Address” field of the eStore’s settings menu? I must be thick headed or something because I just don’t get how this works. > email is from WordPress though; how to change? > The Aweber custom parser finally works. Yay! > but what gets added is Name = WordPress, Email = the email in the Trigger Rule of the parser. Is this how it’s supposed to be? Hi Carrie, This is something you would have to ask AWeber. eStore does not have any control over the AWeber double-opt in feature. The eStore just tells AWeber what list to add your customers too. Any idea if you can turn off double opt-in for Aweber when people are added to the list? As it is right now, I have double opt-in turned off, but it only seems to be turning it off for the web signup form, not when they’re automatically added to the list upon making a purchase. You only need to setup a parser if you are using AWeber integration with eStore. This includes using the eStore’s squeeze page form. If you are using the plain Squeeze form that you got from AWeber then you don’t need to follow this instruction. When you use free trial the email will get fired when you actually receive the payment for the first installment (in 7 days time). Basically, the actual transfer of money triggers it. I found out that as my products have a free 7 day trial then an email is not getting fired for notifacation of the sale. So I have changed the trial to £0.01 and it works great now. I’m trying to get them onto an AWeber list as well. that works but I have the same issue as Chuck above. It is signing up WordPress to the Aweber list, the sign up email is being sent to me rather than the customers email address. This blog post is simply out of the box. Many other posts i have seen on this topic but this is the one i was searching for. I would like to subscribe to your feed and bookmarking the site now. Thanks for posting. Success can happen with internet marketing, but contrary to what many people believe, success does not materialize like magic overnight. You have to work your way to achieve it. You only need one parser. I want cutomers to be signed up to a dedicated aweber list depending on the poduct they have purchased. Do I have to set up separate parsers in aweber or can i use the same one for all products? 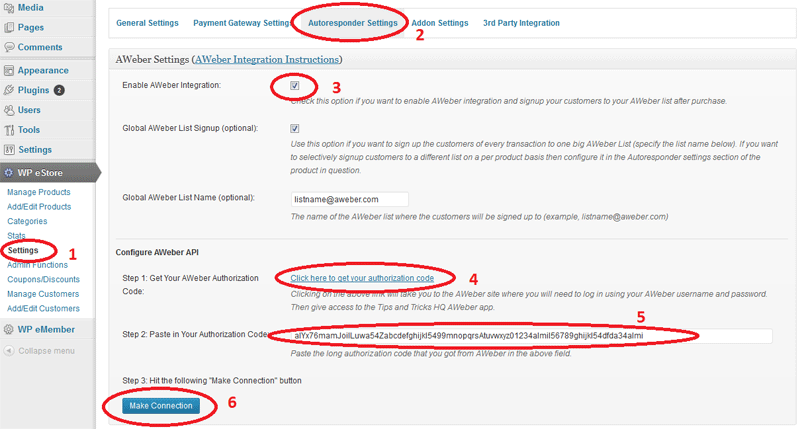 When the “Aweber Integration” option is used the customer name and email address is automatically signed up to the specified AWeber list. No, the eStore do not do anything that will unsubscribe the customer from a list. set up the Aweber parser as described. Went through two test transactions. 1st test subscribed “wordpress” [email protected] as the aweber list subscriber. Here “wordpress” has been given as customer name and the email address is the same as the from email address setting in wp-eStore. second test did not subscribe a new person even though a different email addr was used. But that name was not signed up. Hi Aswad, Happy new year to you too. You simply specify the list name for that specific product in the “Autoresponder Settings” section of that product. One thing I wonder. What’s the easiest and simplest procedure if I have 3 different products and want the buyers to be registered on 3 different lists according to their purchase ? @entrepeneur, there won’t be any problem with repeat emails. If an email address already exists in the list the AWeber will simply ignore it. I’ve purchased both WP estore and Affiliate platform. Everything’s great so far! One question: I already have a list in aweber that contains everyone who signs up for my free newsletter, in my website. I want to create a parser for that same list, so that when someone makes a purchase he is added there. Would there be any problems if his email is already in the list because perhaps earlier he has signed up for my newsletter, before he bought the product? I know maybe this is something I should be asking aweber, but I thought you might already know. Looking forward to Mail Chimp which is a great little app. I will let you know when I finish working on this integration. I send emails to my clients with the updated version when I release a new version. Hi Donna, I have received good feedback about MailChimp. Their API looks pretty neat.. I will definitely integrate this. Excellent news, thank you Amin! I’ll let my client know too. Will you post here when you have finished the integration? By the way, does the plugin automatically notify us when there is an upgraded version? I know some do and some don’t. I was wondering if you’d be willing to add MailChimp integration to eStore? I’ve purchased the plugin and so has one of my clients on my recommendation. I’ve decided to go with MailChimp and let go of aweber, I’m pretty sure my client will as well. I’ve found them to be really great to work with, and they are keen to integrate with lots of great applications. Yeah the customer can checkout fine… AWeber simply won’t add that email address to the list as it’s already there. When you have a repeat customer, what happens? Since they will already be in the Aweber list, are they still allowed to check out? Hi, yes, I’m using infusionsoft and they say I can use Application Programming Interface (API). I’m allowed to pass order data into Infusionsoft from another shopping cart, just don’t know how to do it. @Linda and Md, I have plans to add integration option for other Autoresponder services but I can only do it if the autoresponder you are talking about allows 3rd party integration (Aweber allows this so I have added this feature). Hello, can this be set up using any of other Email marketing and Autoresponder services? I was wondering the same thing. I use GetResponse.